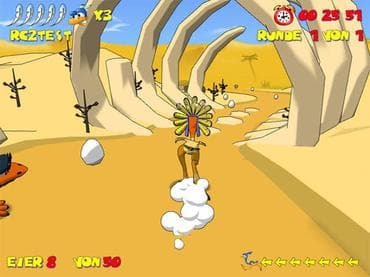 Fascinating animated arcade racing where the main ostrich heroes are funny and a little bit crazy. Try 8 different worlds with many obstacles and rivals! Download free full version game today and embark on this amazing journey! Free Game Features: - Family friendly arcade racing game; - 4 secret bonus levels; - Up to 7 rivals in the single player challenge; - Up to 6 power-ups per challenge; - Split-screen fun available for 2 on one PC; - Multiplayer challenges via LAN and Internet; - Cell shading technology for fantastic toon-style graphics; - Free full version game without any limitations. If you have questions about Ostrich Runners game, please contact us using this form.